Christmas trees are old news for those of you who put yours up several weeks ago, but there’s a rule in our house. No tree before Thanksgiving, preferably not before Dec. 1. Ours went up today, Dec. 6. There was nothing magic about the date; both of us were home and it seemed like a good idea. Unlike years past, we opted for the fake tree we bought in Charlotte three years ago. No muss or fuss about finding a tree to fit the space; all that was decided at the Peppermint Forest Shop in 2013. I’m the one who adores the smell of Fraser fir, but once you’ve invested in an artificial, you have to justify the expense. Decorating the tree is my bailiwick because I’m the one who wants to put the tree up in the first place. There was a time when I would solicit help to string actual glass bubble lights on a real tree. That time has faded in favor of simple—and boring–white minis that take a fraction of the time to install. Then I drape our vintage strings of pearl beads. I’m eclectic when it comes to ornaments, though this year I’ll admit I leaned toward colored glass and away from Hallmark comemoratives except for one dated 1979. A relative bought us a nice “Our First Christmas Together” Hallmark ornament back in the day when “together” meant newlywed. A friend bought us a spare which came in handy a few years later. At some time in the mid-80s my husband and I were deconstructing the tree. Fragile ornaments were piled everyplace and for some careless reason, we thought it was OK to place several of them in a toy wagon on top of the television set. I still remember the sound of the wagon crashing to the floor and the sight of our prized ornaments dying before our eyes. Among them was the fancier, more beautiful version of “Our First Christmas Together” smashed to bits, part of what I refer to as the ornament massacre. Over the years, we’ve gone through ornament phases—braided straw, crocheted snowflakes, needlepoint, Hallmark collectibles, small stuffed toys and china figures inspired by Beatrix Potter. When my mother passed, I inherited some elderly glass ornaments, including a plastic cottage cheese lid upon with a picture of Rudolph cut from an old Christmas card. I made that one myself around 1959. This year’s tree will have samples from our history. There will be some small red glass balls that were the only ornaments we had in 1962, when my family was living in a rented house in Tampa. There are two angels I made in Scouts that have foil wings and glass bell skirts. There is the red wooden stocking “Merry Christmas Mom and Dad” that our son Lantz made for us in 1988. And there is a Harrod’s red-coated guard bought on a friend’s honeymoon to London in 1997. There is a cuckoo clock ornament bought on our German vacation. And a bisque lobster platter, a nod to my alma mater in Maine. All of these and others go on our tree along with a “Ten Years Together” ornament that my Mother bought us in 1989, before Alzheimer’s made her forget who we were. A small stuffed cat has rested in the branches of every Christmas tree since 1999. The cat was rescued from one of the bouquets sent to my Dad’s funeral that year. Dad had a thing about cats. This year, our first as grandparents, I took a bold step by calling our son to see if he might be interested in part of our horde of ornaments. Baby Violet might like to grow up with some weird old stuff on her tree. 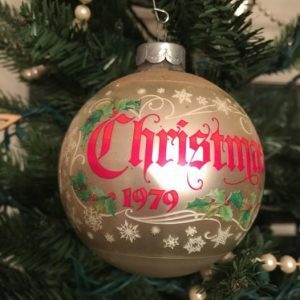 Yes, he said, they would like some old ornaments, so this weekend I’ll sift through boxes of the extras, picking some to ship to California–pieces of our past to share with the future.